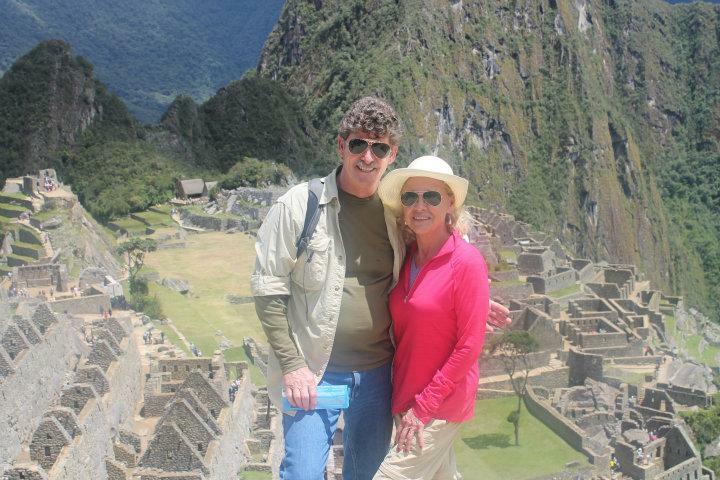 Machu Picchu, Peru - February 5 & 6, 2015 - Blog from Aguas Calientes, Peru | South America!! I slept better last night than I have in months. Months! This includes time in my own wonderful bed. Our accommodations at the Hotel Pakaritampu were great. First of all, it is situated in a climate much like Northern California. The air was dry, cool and crisp—no air conditioning is needed. A soothing-sounding natural steam ran all night long through a stone lined channel built many centuries ago by the Incas. It sang us to sleep and blocked any unnatural sound. Birds chirped through the night but somehow it was just as it should be. We had a delicious light breakfast of fruits, fresh breads and yogurt in the dining room. The attendants were sweet, appreciative of our patronage and happy to get to practice their English and laugh at our Española. We walked from our hotel to the train station and boarded a first-class vista dome train to town of Aguas Calientes. There we boarded a luxury bus for the steep winding road leading up the mountain to Machu Picchu. The narrow, one-lane dirt road consists of collection of steep lengths with 90-degree switchbacks cut into the side of the mountain. I must stop here, first, and give credit to the tour guides, drivers, ticket-takers, and attendants at important visitor locations. I'm sure for them it is worse than a goat rodeo or worse than trying to herd cats, but these guys do it with style and grace. We met our guide at the entry of Machu Picchu and began our adventure. The weather this day was an absolutely beautiful - we could see forever! Our guide, Walter, told us that it rained every day last week and his visitors were very disappointed. The weather could have made a repeat today, but it did not - we are so, so lucky!! We had a glorious day! Our photos cannot even become to represent the vast, tall, grand beauty we saw in the mountains and valleys today. We wondered how the landscape was formed. We wondered how the Incas made their homes and temples here. And we respect the fact that they abandoned this glorious place and destroyed the trail to Machu Picchu so that the Spaniards could not find and destroy it. The Incas first had their capital in Cusco. As the Spanish began to conquer Cusco the Incas moved their capital to Quito, Ecuador to avoid a Spanish takeover of the Incan Empire. Later as the Spaniards approached Ecuador, the Incas moved their capital once more to the remote area of Vilcabamba, Peru, 100 km to the West of Machu Picchu—ironically, said to be the center of Peru's cocaine world today. It is also said that when this most sacred place was abandoned by the Incas, the Inca trail leading from Cusco to Machu Picchu was destroyed! It was sacrificed so that the Spaniards could not find Michu Picchu. That tactic worked. Infact, except for a few indigenous families who lived in the area, no one knew this sacred place existed until 1911 when explorer/archiologist, Hiram Bingham stumbled on the site as he looked for the "The Lost City of the Incas." Seems a native farmer and his son led him to the jungle-covered sacred place, Machu Picchu. We climbed all over the site. I will say this, if you hope to see the great sights of the world, you must listen to this advice. You must do it while you have strong legs and heart to carry you. The climb on rough-hewn stone steps is not easy, and it is more treacherous as one travels down the mountain. To arrive at the first fantastic viewing point, you walk up 400 totally uneven, irregular steps . . . and if you are lucky, your climb will be in the sun; if not, you will walk the steps in the rain. But the sights are unbelievable. I must have taken 50 or more pictures of the same mountain-view simply because the beauty was different from a slightly different angle. As we climbed up and down, we first wondered how these steep mountains were formed. Next we wondered why the Incas decided to make this a site of one of their important temples. Then we began to wonder what kind of management system they could have had to accomplish so much requiring so many specialized skills like astrology, architecture, agriculture, physics and more. There had to be great leaders with great visions and great management and communications skills. It was a tough trek but I'm so happy we didn't decide to do with a baby in tow (as some did) or when were too old to climb. There were lots of old codgers out there with walking sticks. They were able to see the lessor sights but could in no way, climb to the primo spots. Then, gosh! We met so many wonderful people on these trails and on the bus and on the train. With some we communicated easily; with some we communicated adequately but spoke only a very few words of each other's language. It was wonderful! Our guides are paid to not only get us up and down the mountain, point out important sites, but also to impart historical facts and science. I loved hearing it all, but without Google, I will never recall a word and certainly not the spelling. When we finally reached out hotel, we were delighted to find that it is brand new and situated along the roaring, fast-moving Urubamba River or Vilcanota River as it is also called. Our room was on the river side, a very good thing. Train tracks are only 10 feet or so in front of the hotel. Can you imagine a room on that side??? Too tired to post photos or the blog last night, we slept well and explored the little town of Aguas Calientes this morning. We leisurely shopped and took pictures - what a nice break from our otherwise jam-packed schedule. We have a train ride and a bus trip this afternoon to put us back in Cusco for the night. Then we will fly all day tomorrow for Quito Ecuador. As a note, some of the strange words and names seen throughout this blog which obviously are not Spanish are Quechua - the ancient language of the Incas. cody " worse than trying to herd cats" HAHAHAHAHA!! !